How to write a script that entertains and reaches your audience. Topics include BRAINSTORMING PLOTS as well as ANALYZING THE TRICK FOR WEAKNESSES and many others..
One of the most neglected and misunderstood aspects of performing is: What do I say - how do I say it - and why do I say it? In other words - SCRIPTING! This ebook is written for the magician who performs for people and wants to have better patter than just "Hey, wanna see a trick?" It's written to be used by a performer who wants to amuse, entertain, and add an extra layer of deception to his magic. It's for the magician who wants to have a "reason" for the magic. Performers who want to try and reach their audience at an emotional or intellectual level. 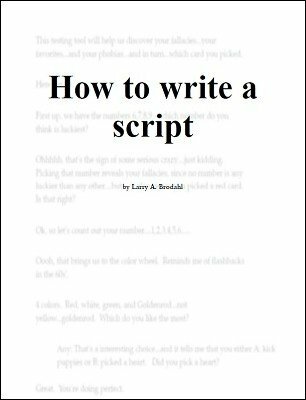 This ebook shows you how a script is written for a magic trick, using a real life example. This example was written WHILE the book was being written using the exact methods shown. 1st edition 2016, 43 pages.